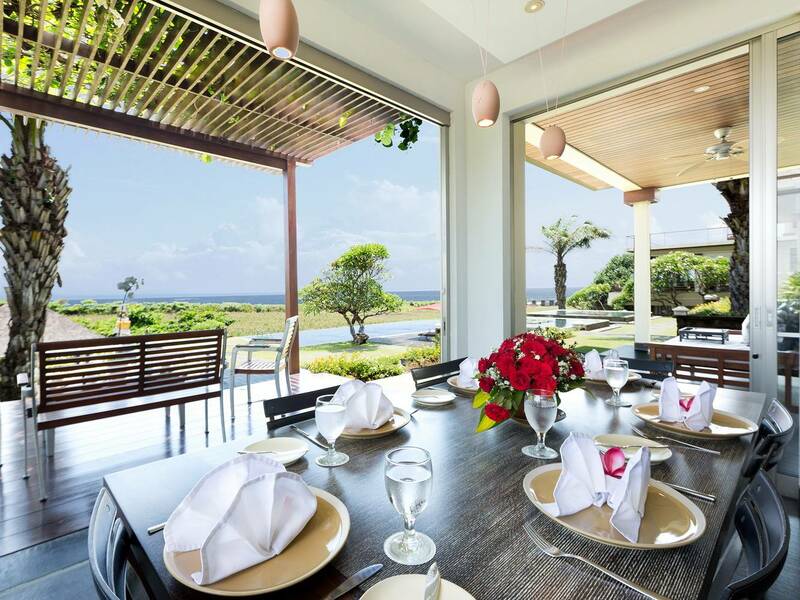 Sanur Residence is a sleek three-villa, nine-bedroom estate on Bali’s south-east coast, blessed with uninterrupted ocean views. 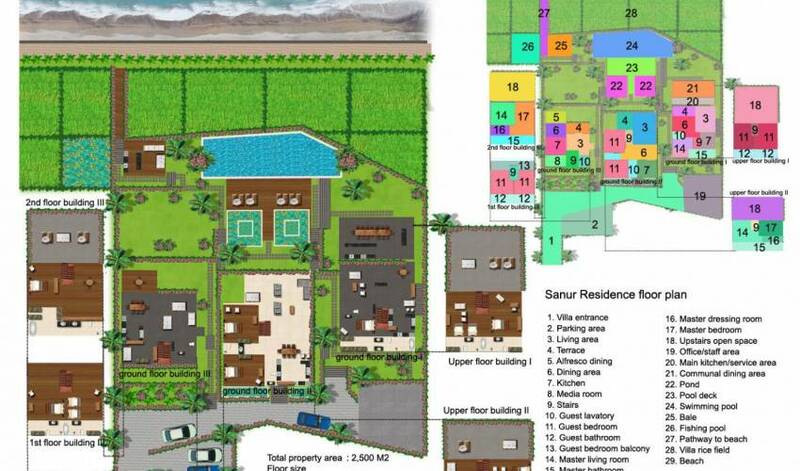 Each villa contains three bedrooms, an open-plan living, dining and kitchen area, and is air-conditioned throughout. The villa is ideal for large groups who wish to holiday together but also enjoy their own space. 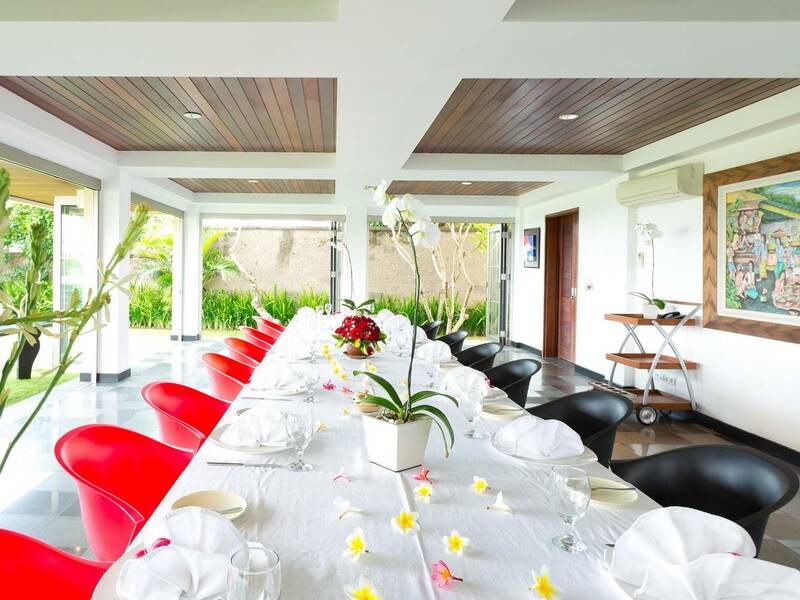 It is equally well suited for parties, conferences and weddings, with one villa housing a meeting/dining room large enough to seat everyone. 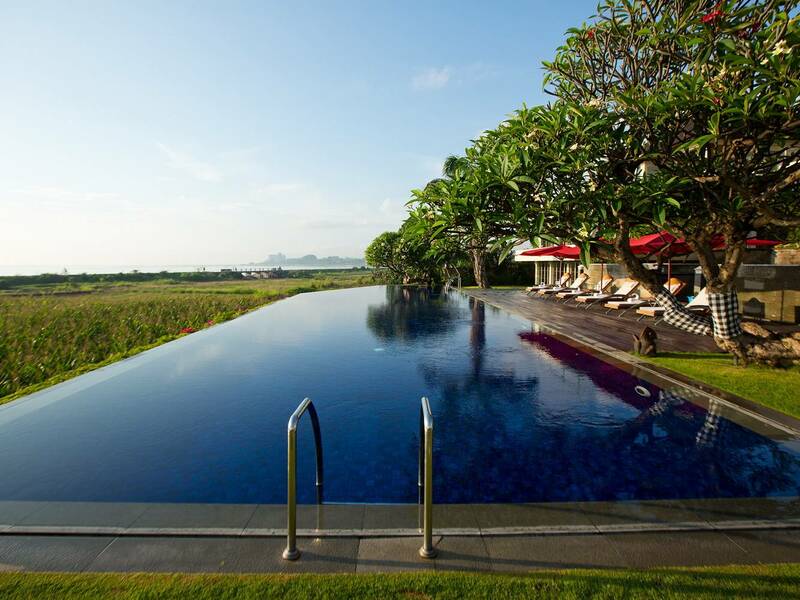 A 23-metre infinity pool and huge lawn deliver yet more social space, and a large staff team provides delicious meals and superlative service. We designed the villa to meet the needs of our own large family who love socialising but also enjoy having their own private space for rest and relaxation. What resulted was three self-contained buildings facing the ocean and surrounded by maize and rice fields, each with three spacious double bedrooms, dining and sitting areas, kitchens and large rooftop terraces. Inside, our treasured art collection adorns the walls, while outside you can enjoy the gardens, relaxation pavilion and our beautiful blue-tiled 23-metre swimming pool and sun loungers. Each villa features granite floors and an open-plan living and dining room furnished with comfortable sofas, coffee tables, dining table for either six or eight, and a satellite-channel TV and DVD player. Each has an additional sitting area overlooking the gardens and view, as well as an integrated well-equipped kitchen. Villa two also features a breakfast bar. 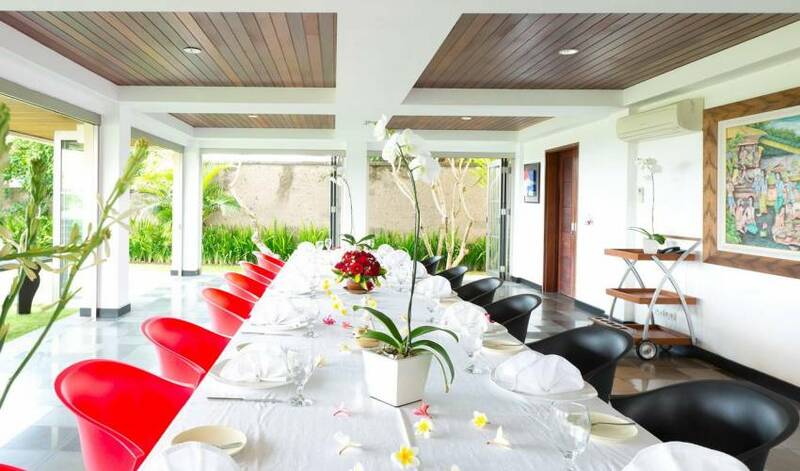 A unique feature of villa one is the light and airy ground floor dining/meeting room with eight individual tables that can be joined together to create one large table for 25 guests. 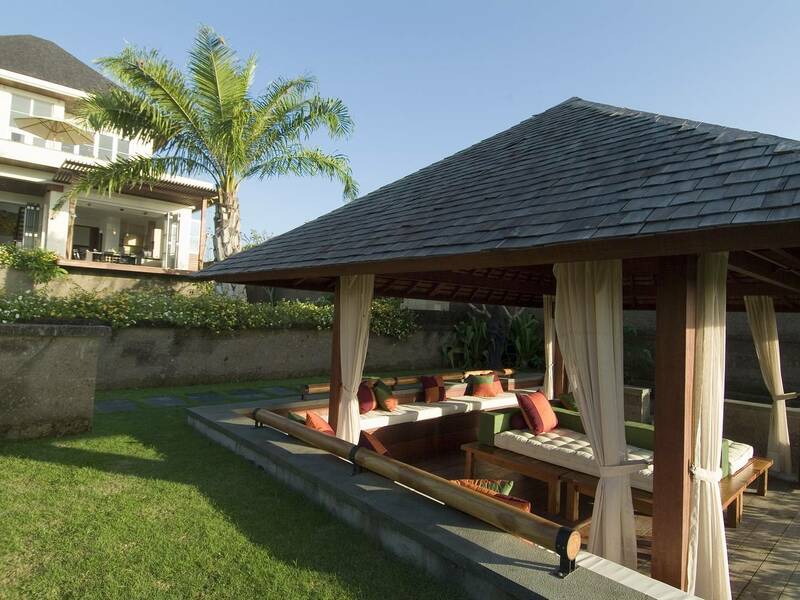 The terraced landscape ensures that even at this level, guests can enjoy the view. 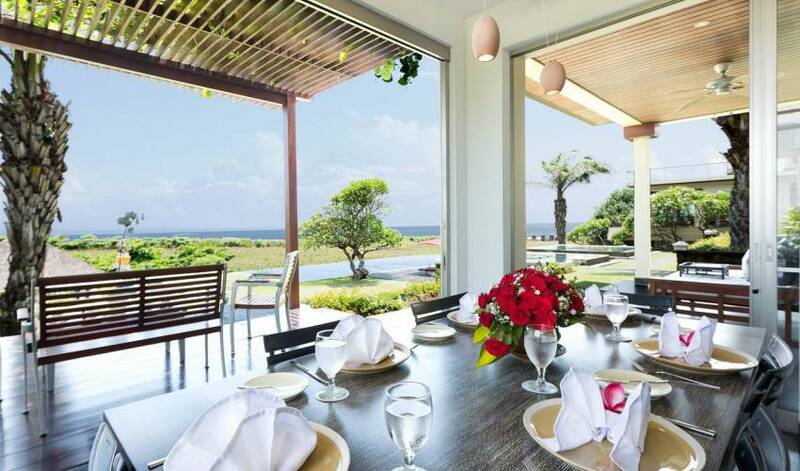 Glass doors on three sides open up to create a semi-open-air dining experience. Next door is a full service kitchen, wine cellar and adjoining guest washroom. In addition to its airy living and dining areas, Villa three also boasts a self-contained media room with a 60-inch screen for projecting movies and satellite TV channels. The room is furnished with a comfy sofa and bean bags for the kids. 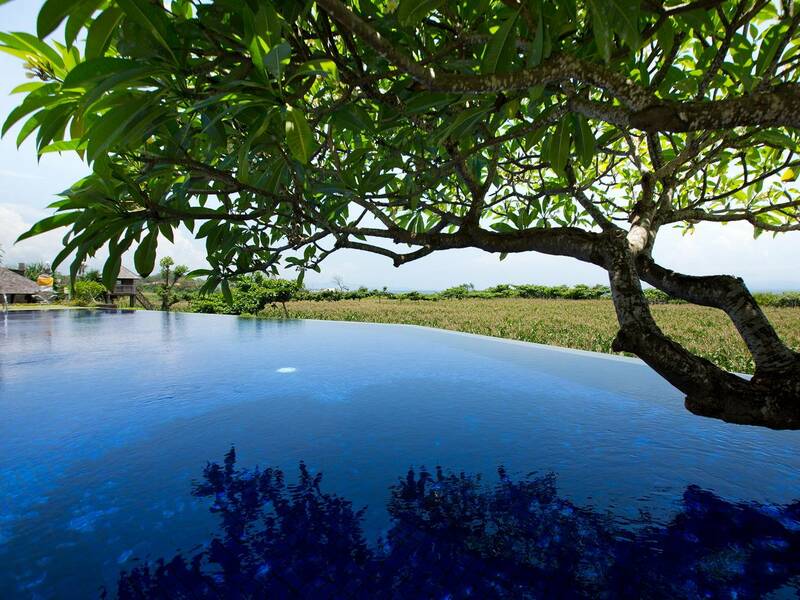 Centrally positioned in front of the three villas is an enticing 23-metre infinity pool that appears to flow into the view beyond. 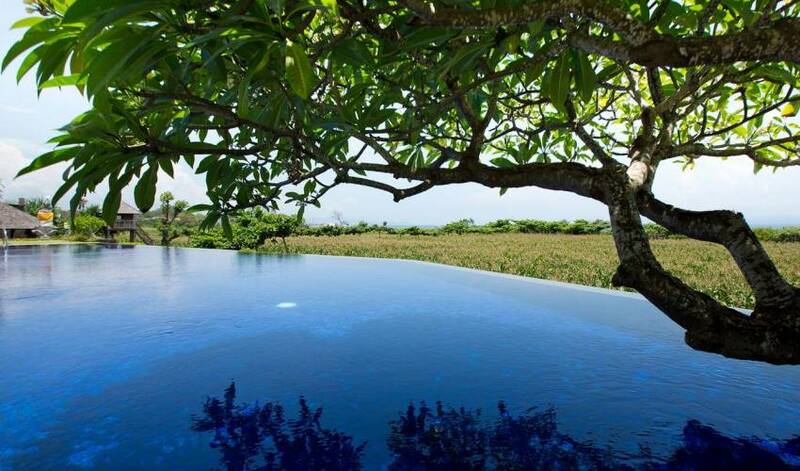 Colourful frangipani overhang the timber pool deck, which is furnished with loungers shaded by large umbrellas. Just above the pool a pair of lily ponds reflect images of the villa in their crystal clear water. The villa’s immaculate gardens beckon guests to laze in one of their many relaxation areas with a book, or perhaps a cocktail. The gardens are arranged over wide terraces and on the lower of these is a sunken balé pavilion facing the ocean view, complete with comfortable cushioned seating. There are three master bedrooms at the Sanur Residence, one in each building, with two situated upstairs and one downstairs. One master is furnished with a king-size bed, one with a queen-size bed, and one with twin beds convertible to a king. Each is fitted with folding doors that open either into the garden or onto a generously sized terrace, and all have spacious dressing areas. The grand-master suites all boast a sitting area and large picture windows overlooking the rural scene. Fashioned in marble, each of the master bedrooms’ light and airy ensuite bathrooms is fitted with twin washbasins and a rainshower. An oversize jacuzzi bathtub is set in marble beside a frosted glass window. The two guest rooms in each building are positioned in pairs and furnished with a choice of queen-size or twin beds that convert to kings. Marble bathrooms are ensuite and come with showers and a jacuzzi tub (shared with the neighbouring bedroom in villas one and three, but made private with sliding frosted glass doors), apart from in villa two, where the two guest rooms share a shower room. 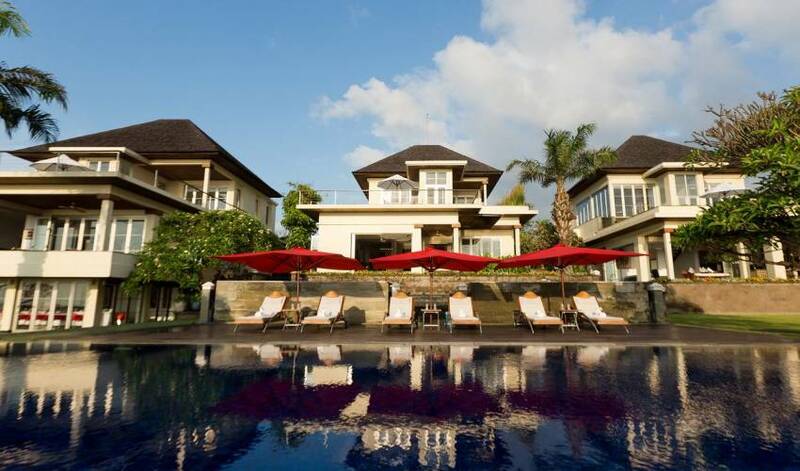 Sanur Residence is located in a quiet rural setting just 100 metres from Padang Galak Beach and four kilometres north of family-friendly resort town, Sanur. 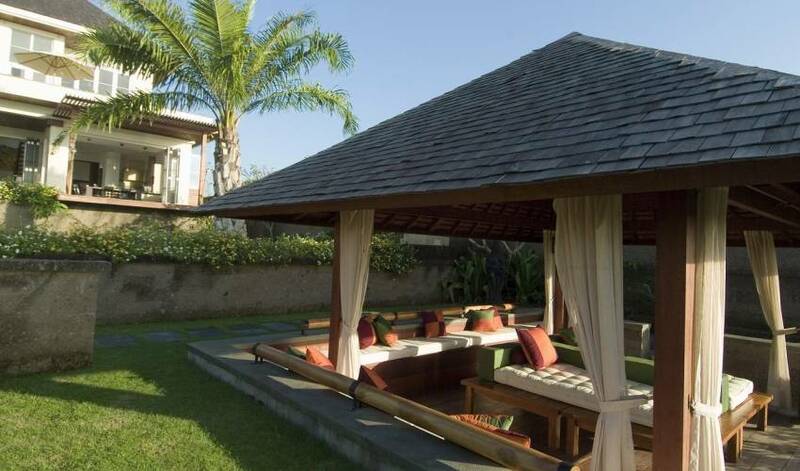 Situated off the Bypass (also known as Sunrise Road), that extends all the way from Kuta to Candi Dasa, the villa is easily accessible and within easy driving distance of most of Bali’s main tourist attractions. Guests can walk or cycle along the paved beach promenade to Sanur’s many restaurants, bars or shops. Sanur is also a great place for water sports such as jet skiing, surfing, stand-up paddle boarding, fishing and swimming as well as kite flying. 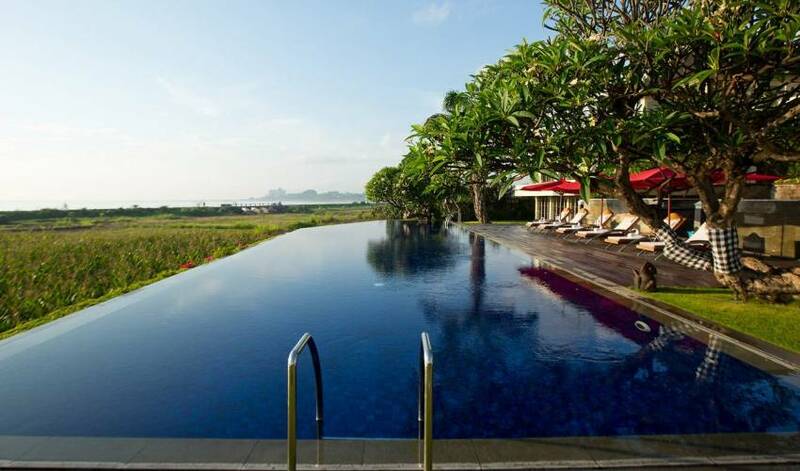 The Bali Beach Golf Course is also just a stroll or short drive from the villa. For those seeking traditional Balinese culture, transport can be arranged to Ubud and the Sukawati Art Market. Other nearby attractions include the Saba Riding Stables and the Bali Safari and Marine Park. 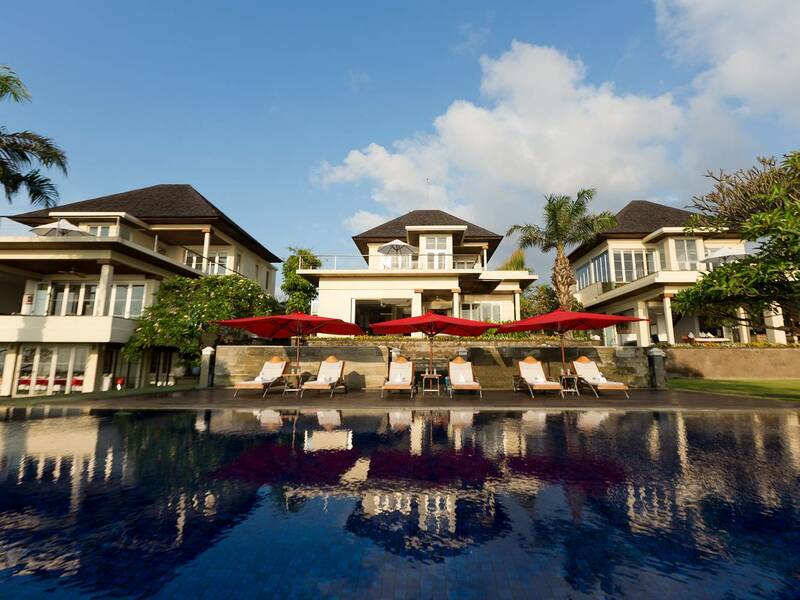 The villa we stayed in in Bali was out of this world…so amazing and everybody loved it.